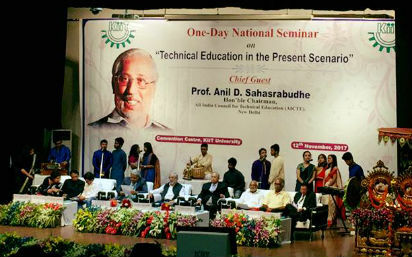 Bhubaneswar: One-day national seminar on technical education in the present scenario was organized in KIIT on Sunday. Prof. Anil D. Sahasrabudhe, Chairman, AICTE joined the seminar as Chief Guest. He said, technical education curriculum should be upgraded. Humanities and Social Sciences should be introduced in engineering courses. This is the time the students have developed ability to learn themselves and create a habit lifelong learning. It has to be embedded in the psyche of students. Students should be upgraded their selves. In this connection teachers’ role is most important. They should give importance on self learning. Dr. Ajay Ku. Mohanty, Director, Delloit Consultating, USA said, our education system should be globally comparative. So we can make the right choice and we can lead the globe. For this students should study and work hard, unless they can’t compete with the best. Sometimes mind is influenced great teachers. Teaching is always communicating. Teachers play an important role in teaching-learning process. Technical education is extremely important for productive growth, so more investment in technical education is necessary. Dr. B. N. Nanda, Sr. Adviser to the Ministry of Labour Welfare and Employment, Govt. of India discussed on professional education in relation to civil services. He said, from 2010 more and more professional and technical students are getting success in all India Civil Services examination. Today the number is close to 60 %. Technical and professional education students who enter into civil services can use their professional and technical expertise in their workplace. But most of the technical and professional students choose humanities and social studies in civil services examinations. Therefore there should be reforms in public service examinations, so that, these students can choose their respective technical and professional subjects. Among others, Prof Subhas Ch. Parija, Director, JIPMER, Pandichery; Prof P. P. Mathur; Dr. Achyuta Samanta, Founder, KIIT & KISS; Dr. Harekrushna Satapathy, VC, KISS University; Prof. Hrusikesh Mohanty, VC, KIIT University and Dr. Sasmitarani Samanta, Registrar KIIT University also spoke on the various aspects of the technical education in present scenario.